Methodist Episcopal missionaries, Rev. Daniel Lee and Rev. Henry K.W. Perkins, arrived at the Dalles of the Columbia on March 21, 1838. They spent the next several months erecting the Wascopam Mission building, where they began their work to bring the white mans "religion" to the natives of the mid-Columbia. For twenty five years, half a million people pulled up stakes and headed for the farms and gold fields of the West. Oregon was the destination for about a third of the emigrants . From 1843 until 1845, wagons could reach The Dalles, but from there if the emigrants wished to press on westward, they had little choice but to make a raft of pine logs, buy a raft from enterprising Indians, or rent a bateaux (a light flat-bottomed riverboat) from the Hudson’s Bay Company for around $80. Sam Barlow devised a plan to build a road from The Dalles to the Willamette Valley, avoiding the Columbia altogether. Just one obstacle stood in his way: Mt. 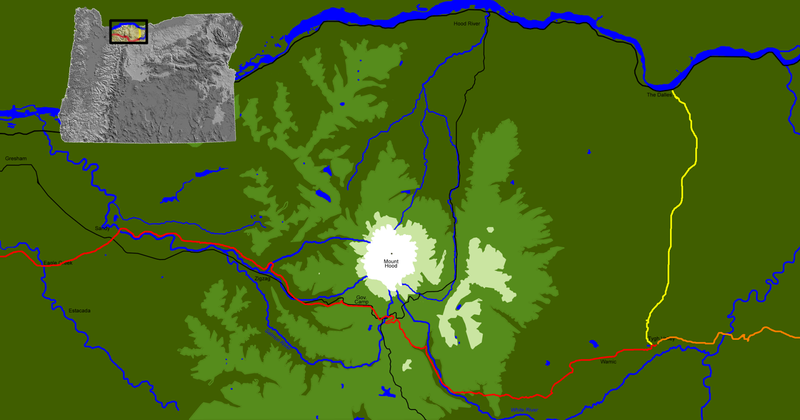 Hood (all 11,250 feet of it)... Barlow obtained official permission to build the Mount Hood Toll Road in early 1846. 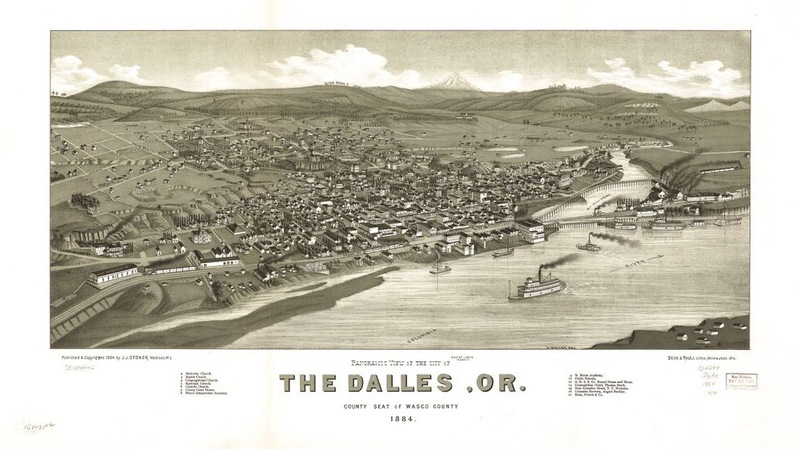 Dalles City was designated the county seat when Wasco County was created on January 11, 1854 and was the second largest county in the country at the time. In ten short years, between 1850 and 1860, the sparsely populated outpost of Fort Dalles exploded into the booming western town of Dalles City with a swollen “floating tent” population of 10,000, filled with soldiers, god-fearing missionaries, gold miners, tavern owners, bordellos, immigrants, adventurers, gamblers and scallywags. 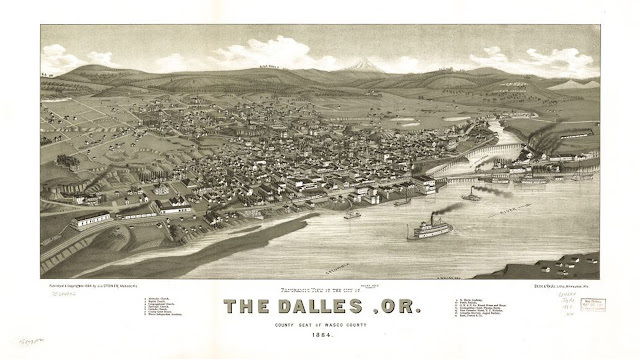 The name was officially change from Dalles (or Dalles City) to The Dalles in 1860. 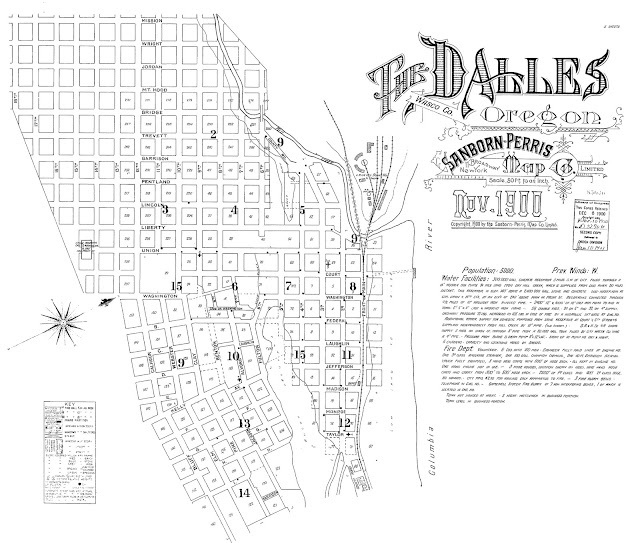 By the time the Gay 90's rolled around, The Dalles was a full blown western city with a stable population of 5,000 souls, spread over an area encompassing dozens and dozens of square city blocks. The Dalles, like any proper western town of the era, had its share of saloons. One of those saloons was named the Germania. It was located in amongst a myriad of other drinking emporiums on 2nd street in the New Vogt Block. It was one block off the railroad tracks and owned by a proprietor by the name of Chas. Stubling. I found the first mention of him in the "Saloon Business" on the front page of the December 16, 1890 edition of the Dalles Daily Chronicle. He advertised with a boilerplate column ad for quite some time. In July 1891 he advertised that he's opened up a saloon in the building "next door west of the Germania Saloon". Oddly enough, the newspaper reported in September 1891 that he was the proprietor of the Germania Saloon? My best guess is that he'd had new, bigger and better digs constructed for his burgeoning clientele, which had continued to grow since he began to advertise incessantly. He also stressed that he was now both a Wholesale and Retail Liquor Dealer. 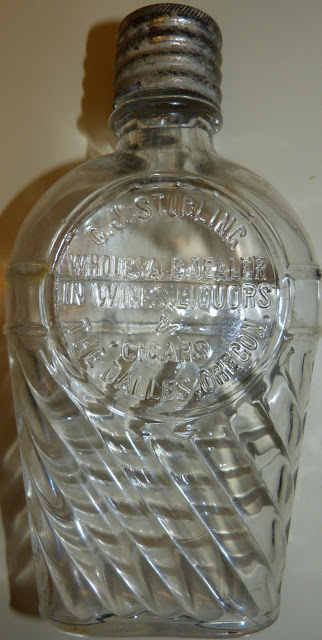 Odds are that it was at this time he commissioned the scarce slug plate amber cylinder embossed, UNITED WE STAND / WHISKEY / CJ STUBLING / DISTRIBUTER / THE DALLES, ORE.
On July 14, 1892, Chas. Stubling announced another change; a partnership with an Owen Wilhelm. It was at that time that all advertising changed to focus strictly on retail sales and the saloon trade. 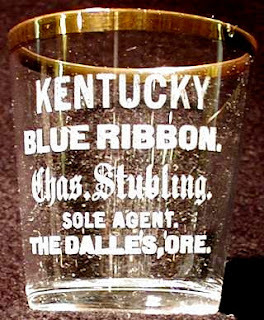 On September 2, 1892 all hell broke loose, literally; The BIG FIRE OF SEPTEMBER 2, 1892 burned Stublings Saloon to the ground. By December 1894 I found reference to a new retail endeavor, "Stubling and William's Sample Rooms" located at the corner of 2nd and Court Streets. In 1895 a new ad came out showing an address of 94 Second St. (one in the same). A few years went by when an edition in the same rag, dated March 26, 1896, announced that they had relocated to J O Macks "old stand", located on 2nd between Washington and Federal Sts.. Things stayed status quo for the next few years; bordering on boring. Every ad looked like the one before~ Finally, on January 21, 1899, a change; a big change. Stubling had gone solo again. He was once again pushing the wholesale trade and had obtained sole agency for Yellowstone Sour Mash Whiskey, a well known and popular east coast brand. I'm guessing that the mold for the tooled amber cylinder with the Riley patent inside thread closure embossed "C.J. Stubling / (logo) / The Dalles Or." was commissioned at this time as well. 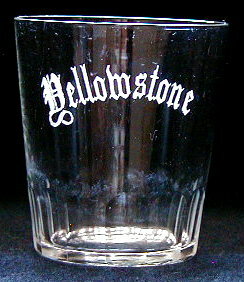 He also placed one order for etched shot glasses to further promote his new endeavor. In addition to the fifth and the shot, two flasks were also produced; one a token, the other a basket weave. All are about as common as a pair of lips on a chicken! After that ad appeared, all Dalles Stubling liquor trade newsprint advertisements vanish. His involvement in the wholesale end of the business obviously continued though, as he is mentioned as a wholesaler in ads published in the Condon (Oregon) Globe as late as 1904. A brief reference to him having accepted a "bad check" in the amount of $62~ from a "Hindoo" at the "C.J. Subling liquor house" was the last thing I could locate relating to his liquor business. It was published in the Hood River Glaciers March 11, 1909 edition. C. J. Stubling's life after 1909 is yet another story. Thanks to Jeff W and ABA for the UWS photo! Thanks to RP for the shot glass photo! Thanks to Zigs for the flask photos! Great article Bruce! I can account for four of the "slug plate" fifths in collections, so they are rarer than "scarce". Thomas indicated they came with a glob top, but all known examples are tooled. I have never seen the basket weave shoo fly flask before! Another fantastic research article Bruce!